I would argue that diet is the biggest adjustment when you are transitioning to a vegan lifestyle. A lot of people try to go vegan but struggle with it or give up because they find it hard to make replacements in their diet and don’t know how to create a balanced diet. The other challenging part of a vegan diet is the ingredients lists on packaged foods. 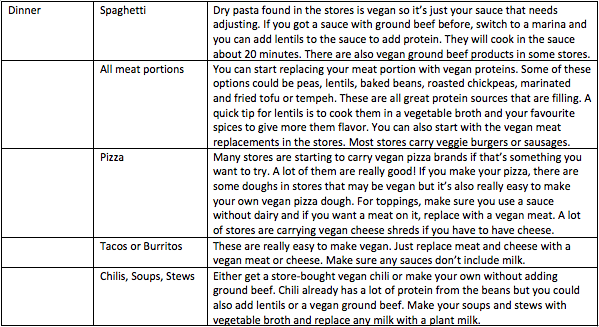 Below are my suggestions for making grocery shopping easier and for making replacements to make vegan meals. There are some vegan pantry staples you may already have stocked up but there are some new additions you need to make to your list in order to replace your non-vegan ingredients. This list is my suggestions for ingredients you should stock up on as you start vegan cooking and trying out vegan recipes. There are a lot of preservatives or additives that are derived from animal sources and it’s of course hard to remember all of them. You can find a list of non-vegan food additives at www.veganeasy.org. Something to note about this site is that it claims lactic acid is not necessarily vegan but everythingvegan.com suggests that most lactic is made from a vegan source. You can decide whether you want to use products containing lactic acid that don’t specify it’s vegan. I personally think it’s not a big deal if you buy something with lactic acid in it. Even if it’s not vegan lactic acid, the amount in it is probably very, very small. – Anchovies (Fish) found in sauces, condiments etc. – Whey (Dairy) found in granola bars, cereals, crackers etc. – Casein (Dairy derived) found in some lactose-free products etc. – Honey/Beeswax found in granola bars, cereals, sauces etc. – Gelatin found in marshmallows, jellos, pudding, candy etc. 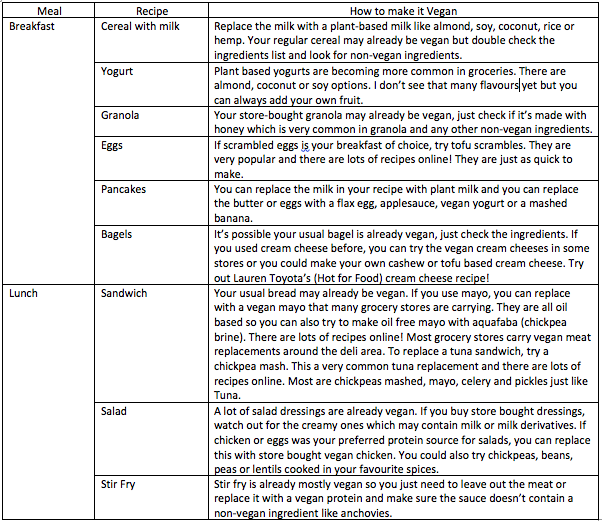 Below are my suggestions for switches you can make to each meal that will get you started with vegan cooking. When you’re just starting it can be easier to get the vegan meat and cheese products in the stores. A lot of them are really good but some are pretty high in fats, sodium and made with oil. They shouldn’t become a staple, just a once in a while indulgence. For now, use this guide to make your first few weeks of the vegan diet a little easier while you’re learning how to cook vegan and finding recipes. I picked some of the most common recipes but for the ones not mentioned, these tips will also apply to. The reaction you get from your friends and family when you telling them you’re going vegan can vary greatly but it’s possible you’ll get some pushback from some people who are not accepting of veganism. You will likely get a lot of questions and probably have to answer the same questions over and over as you tell more people. I sincerely hope that no one in your life is mean to you for making this choice but the benefits of a vegan lifestyle far outweigh the negative reactions you get from some people. As it becomes more common, there are always other people who will support you and other vegans you can connect with. The following are the most common questions I have heard from people and my suggestions for points you can use to explain your choice to people. You can of course speak for yourself but these points are common beliefs among vegans and facts that help to explain the benefits a vegan lifestyle and it helps to be ready to respond to these questions. I decided I don’t want to eat animals or animal byproducts for ethical, health and environmental reasons. We don’t need to use animals for protein anymore, the animal industry is cruel to all animals and there are a lot of health benefits to giving up animal products. I also want to reduce my environmental impact because the animal industry is contributing to greenhouse gas emissions. But where will you get protein? From lentils, beans, peas, tofu, quinoa, chickpeas, seeds, nuts or from vegan meat substitutes like seitan. But you can’t get Vitamin B12 from anything but animal products? I use Nutritional Yeast to get my Vitamin B12 and I take a B12 vitamin a few days per week. It’s way more expensive to be vegan. It’s actually cheaper to be vegan. All of the protein sources I just mentioned are cheaper than meat so I can buy more food for the same amount of money I spent on a non-vegan diet. Plant milk is slightly more expensive but the reduced cost of my protein sources makes up for that. The vegan packaged foods you see in the stores are more expensive than cooking your own recipe but it’s the same way with non-vegan packaged foods. No one is going to be, or should be, eating the packaged vegan foods all of the time. I can buy a lot of my new staples at bulk food stores to save more money. What will you eat at restaurants? Almost all restaurants have vegetarian and vegan options now or they have options that can be made vegan. I can still go out and enjoy a regular restaurant. ** In my 2 1/2 plus years of being vegan, I have always been able to order something vegan at a restaurant. Sometimes the salad or french fries are the only option but that’s better than nothing so I promise you can still go out and enjoy yourself with non-vegan friends and family! This is an area that may take longer to transition and that’s okay. Most of us are not in a place where we can afford to throw out make up, hair and hygiene products or give away clothes that are not fully used and you definitely shouldn’t feel guilty or less vegan for that. 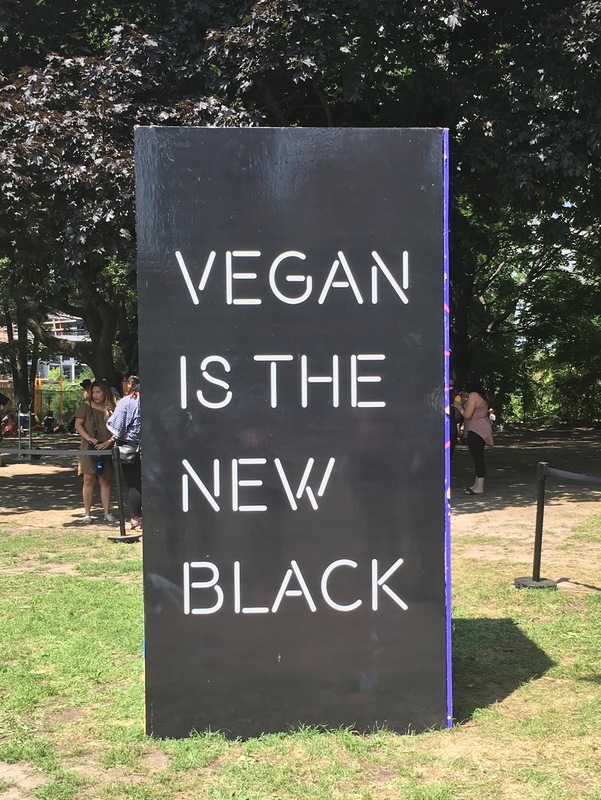 If you are able to transition your non-vegan items out immediately and can start supporting vegan brands or buying the vegan options right away, that’s okay too. Switch out the non-vegan items whenever you can. 5. Learn how to read clothing and cosmetic labels. In terms of fashion, shopping for vegan clothes means checking the label on every item. All clothes label what materials they are made of so my tip for vegan shopping is give your self a little bit more time to check labels. The materials you want to avoid are leather, fur, wool, angora wool, cashmere, mohair, silk, down and shearling. With make up and beauty products, it can be a little bit harder to find vegan products. Some companies are labeling their vegan products but other companies are cruelty-free but they include animal-derived ingredients in the product making it not vegan. I didn’t know this until a little while ago unfortunately. I currently have some products that are cruelty-free but not vegan. I can’t afford to throw them out. I’ve made some lists of vegan options from popular brands and you can find these lists in the beauty section of my blog. I also provide a PDF version of these lists and you can download them to your phone. I like to save mine in my dropbox and then I have it on my phone when I’m in a store. It’s really helpful to have it available as a reference when you’re in stores. Transitioning to a vegan lifestyle doesn’t happen overnight in most cases. It’s okay if you’re not perfect on day one and it’s okay if you’re not perfect on day one thousand. It takes time to make these changes but it gets easier the longer you live this way. Ad Links in this post may be affiliate links so if you purchase from them I will make a small commission at no extra cost to you. This helps me to keep creating new content. Thank you very much for your support! Get blog post notifications to your inbox! Copyright © The Vegan Lifestyle 2019 | Bard Theme by WP Royal.